In July of this year, I decided to give myself a new social media challenge. 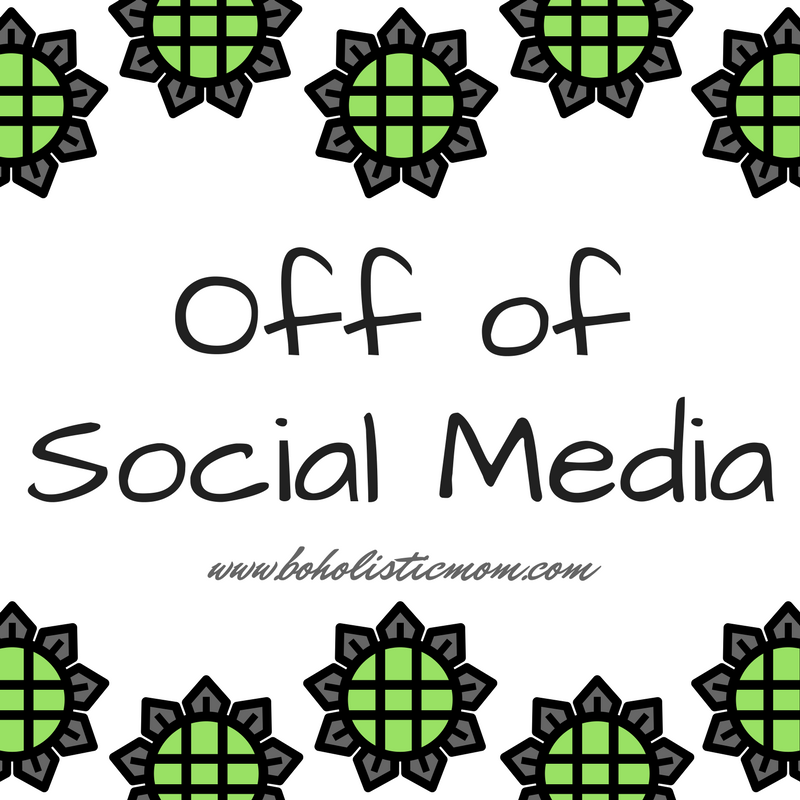 I didn’t accept a social media challenge to post a blog a month, share on Instagram daily, or become the mama blogger of the year, instead I accepted the challenge to avoid social media for an entire month. Because I realized that I was overcome. I was making choices without thinking and I’d find my phone in my hand without having ever consciously picked it up. My subconscious mind, eyes, and hand were conspiring and my time was being sucked away. Something had to change. I decided that July was just the right time to dedicate to avoiding social media. Our habits are often formed in around 20-28 days and I needed at least that long to break this habit. I chose to use the fruit of self-control that I have and take back the control that I had been casting away. I chose to keep checking my Facebook messages to maintain relationships and stay involved with those who directly interact with me personally (not just to the whole of Facebook). We do social media challenges to gain something. Sometimes money, sometimes followers, but this type of challenge has a completely different pay off. What I gained isn’t very tangible, yet I feel that perhaps it has been more valuable. 1. I learned who my friends are. I do not have 671 friends. I corresponded with approximately 24 friends by Facebook message and text during July. TWENTY FOUR. That is 3.6% of my friend’s list. Here is a novel idea . . .
What if I spent more time focusing on developing stronger friendships with those twenty four friends and less time interacting with (and browsing the posts of) the 671 who aren’t really involved in my life? What if when my son did something really cute, I took a picture and I shared it with just one friend to let them know that I value them being involved in my life? What if when I had something happen in my life that I needed to share about, I texted or called one of those twenty four friends instead of sharing it with all 671 people on Facebook? 2. I am back in control of a tool rather than the tool being in control of me. In this life, we can let go of control so easily. We sometimes allow our schedules to rule us. We believe our food choices are out of our control. We even think that our road rage is the other “idiot’s” fault. Yet, we are ultimately in control of all of these things including the tool of social media. 3. I gained back my time. Yes, I know that by admitting this I am admitting to having been a hopeless social media addict. Still, it’s just true. I have had so much more time by cutting my ties with social media this month. I wake up without a phone in my hand. I eat my food without a phone in my hand. I drink my coffee without Facebook in front of me. I had wonderful mornings without considering what I was going to post on Instagram. I would have lunch without snapping pictures for Instagram. I would spend a few afternoons writing new blogs without giving myself over to the distraction of checking updates, notifications, or new followers. My nights were without Facebook distraction and I only needed to know what was going on with my family and my friends. The rest matters minimally. How much time do you lose to social media? I know that by announcing that it makes it less true, but let me explain . . . by not posting all of the time I realized that I am not all important. My voice can go unheard and the world will go on. I do not have to post every day in order to proclaim that I exist. My self-worth is not based on others identifying with my experiences, agreeing with me, or “liking” my posts. I am not important. And yet. I find my true self-worth apart from Facebook affirmation. God can use me mightily for his Kingdom due to His good works in me, but not due to my mad Facebook skills, my hundreds of followers, or my desire to be liked. In fact, I realized through this that He uses me in spite of these. My striving, my desire to be praised, and my want for affirmations through “likes” aren’t good things. Through this social media challenge, I have looked in the mirror and have found my motives lacking. As I continue to use social media as a tool, I hope to proceed forward without a desire to gain approval from anyone but God. 5. The realization that I love my family too much to be distracted by social media 24/7. How utterly stupid of me. No one is more important than my husband and my son. Unless it is a scheduled appointment, no Facebook “emergency” is actually more of an emergency than the risk that my husband and son might think they are second best to a computer or phone. I am NOT going to save the world through Facebook. The END. I love my family way too much to put imagined emergencies and my pride before their very REAL needs. 6. The new understanding that Facebook isn’t real. With the new technology of virtual reality breaking forth, I have often wondered if it is one step too far. Virtual reality seems like such a step forward compared to regular video games. Then I realized that we are already living in a virtual reality called Facebook. We have virtual friends who post their virtual lives (not their real lives, you don’t see those), we post our virtual lives (even if we try to post our real lives, it still isn’t), and we rarely physically interact with these virtual people. We see virtual problems (you don’t know all the details) and virtual solutions (they are impersonal). We see virtual deaths (few details, little interaction, no experience of their full grief nor the ability to grieve with them physically) and virtual births (beaming faces, still pictures, short videos, no sharing of joy between two physical people only short posts of happy sentiments). Facebook isn’t real. It’s a virtual reality. 7. Social media success does not equal actual success or monetary gain. This world asserts that the more social media followers you have, the more successful you are, and the more money you’ll make. I say, bull. I am beginning to realize that true success in business has to do with getting to know your clients, finding their actual needs, and setting out to meet that need in a way that allows you to meet your monetary needs. Can you do this on social media? Maybe. Yet we are leaving out the real world while interacting with the virtual reality of social media. You can gain followers, have a kind of success, and even make money through social media, but the real world needs livers . . . people who live and breathe in the real world. There are a whole group of people who live apart from social media and we are forgetting all about them while interacting virtually with people who are being virtually influenced in a million directions. I am very much interested in interacting on a real world level and operating less on a virtual level. How about you? You have read my personal social media challenge and you have read the benefits that I have personally gained from the experience. Are you willing to let go of social media for a time in order to see what you will gain? I hope that some of the lessons that I’ve learned during my social media challenge have been helpful to your life! The main purpose of my blog and my social media ventures are to reach out to mothers to come alongside of them in their journey toward healthier living and nurturing their family through nourishment and great decisions. Before you log off, you can follow me on –> Facebook, –> Twitter, –> Instagram, and –> Pinterest!